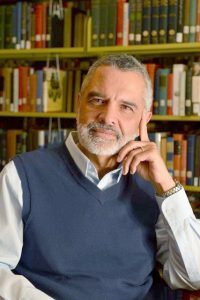 Spanish Professor Eduardo Gargurevich passed away on Sunday, March 12. A memorial service will be held Monday, March 23, at 7 p.m. at First Lutheran Church, 619 Broadway in Fargo. Gargurevich, originally from Peru, started working at Concordia in 1994 – 23 years ago–after teaching at Auburn University in Alabama. Not only did Gargurevich inspire countless of students to delve into the Spanish language and culture through his courses, he motivated students to immerse themselves into the tangible culture and language by studying abroad. He co-created the May Seminar to Latin America. He led the program with other Spanish faculty members several times. For a few years, Gargurevich served as Dean of the Concordia Language Villages summer program to Argentina. He taught summer school in Peru and Spain. Gargurevich was the faculty advisor for the Spanish Studies Abroad programs in Argentina, Sevilla and Alicante. Gargurevich served as Spanish department chair twice. Students and colleagues say Gargurevich’s passion and energy for teaching incited students to further their language students and become responsibly engaged with the world. For Ashley Thompson ‘16, Gargurevich’s zestful personality enticed her to consider studying Spanish. Olivia Crouse ‘16 had Gargurevich as her advisor and as a professor. Some of her best memories at Concordia are of Gargurevich. Mo Sawatzke ‘16 is thankful for having the opportunity to learn from an intelligent, enthusiastic professor. Gargurevich was more than a professor or a colleague, he was a close friend for many. Spanish Assistant Professor Fanny Roncal Ramirez found Gargurevich to be her family in Moorhead. Ady Johnson, Spanish assistant professor, says that the Spanish department will not be the same without him. Chair of World Languages and Cultures Mary Rice has worked with Gargurevich since he began at Concordia. Throughout the years, they created a friendship that everyone strives for. Lisa Twomey, assistant Spanish professor, admires the life Gargurevich lived. Other Spanish faculty express how much they will miss Gargurevich’s humor, intellect, friendliness and his sweet-tooth. I’m so upset that He can’t give away his daughter to me at our wedding. I didn’t want to take her like this. However, I know we’ll all feel his presence, his energy and his love at our wedding anyway. I’ve never really had a father, But he gave me a taste of what having one is like and I will miss talking to him so much. Aww I will miss him. Eduardo was an amazing professor and person. He encouraged my trip to Alicante Spain, the best time of my life. Thanks for an excellent article on Eduardo! I found out from another AUM colleague about his passing, and am truly saddened. Deepest condolences to his Concordia family!